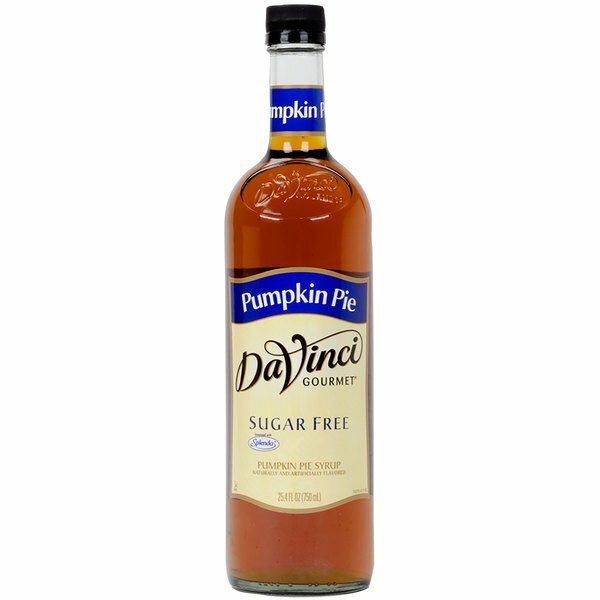 Infuse your drinks and desserts with a taste of the holidays using DaVinci Gourmet pumpkin pie sugar free coffee flavoring syrup. 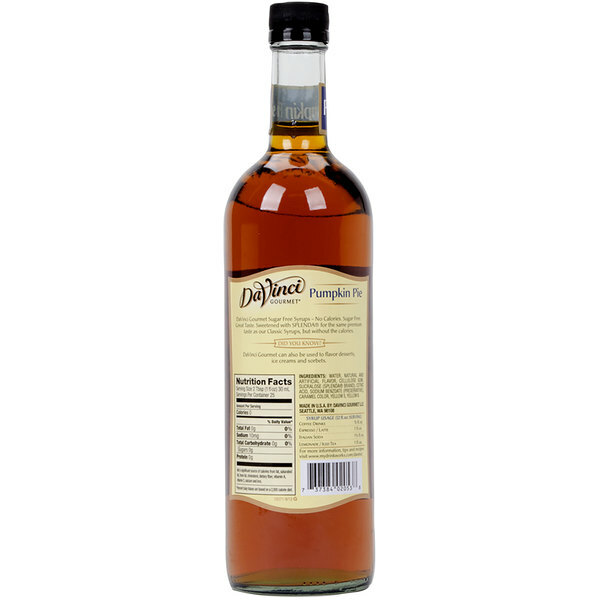 Sold in gourmet coffee shops, specialty food stores, food service outlets, and grocery stores, DaVinci Gourmet products, like this sugar free pumpkin pie flavoring syrup, have a long history of commitment to quality and superior taste. With its rich, familiar blend of pumpkin, cinnamon, nutmeg, allspice and ginger, this pumpkin pie flavored syrup brings a sweet and luscious taste to any dish. Sweetened with sugar free, no calorie Splenda brand sweetener, this coffee flavoring syrup is sure to be a treat for your health-conscious patrons! Blend it into a hot and fresh cup of coffee, and its light consistency and taste will not overpower the coffee's smooth and rich flavor. This versatile syrup enhances any seasonal menu with a taste that's reminiscent of passing pumpkin pie around the dinner table for holiday gatherings. It's packaged in a user-friendly 750 mL bottle that holds about 25 servings, with an attractive shelf presence for your bar or coffee shop. Keep a good supply of this sugar free pumpkin pie flavored syrup on hand, and keep your customers coming back for more of your profitable, holiday-based drink specials and Halloween-themed treats! This sugar free pumpkin pie syrup adds a very sweet taste. It taste beyond good for a sugar free product. It’s delicious and our costumers love it. Very pleased for the great taste of this sugar free pumpkin pie syrup from DaVinci. No everyone can enjoy that great tasting pumpkin pie latte even if they have high sugar. This worked perfect for our pumpkin pancakes. Couldn't tell it was sugar free at all. Would be great for coffees or any other seasonal flavoring. I am generally not a huge Davinci fan but when it comes to sugar-free flavors they have the other brands beat in terms of choices. The flavor in this isn't too bad either. Ordering was easy. Prices were good! Received items quickly! Packaged very well. Makes great flavored coffee. This one happens to be my husbands favorite flavor. Delish! You will not go wrong ordering from this company. I was really not a fan of this flavor, which I was rather surprised by since it has so many great reviews! It doesn't really taste like pumpkin pie or pumpkin spice, just a generically sweet flavor that really does not taste great in coffee. I passed it off to my mom, but even she didn't like it. Thank you for your review, Ashley! We are sorry you did not prefer the flavor of this syrup. For recommendations, please contact our Customer Solutions team! It has the pumpkin pie flavor. Some enjoyed this one in coffees, hot and iced. It would have been better if something other than splenda was used to sweeten it. This is must have flavor for the autumn time of year. A very nice flavor is a no brainier for lattes, mochas as well as the classic pumpkin cappuccino. use this in pumpkin pies and smoothies, thank you for the timely manner on which it came in. packaging was great. no breakage. it t is a keeper! This is a great addition to my morning cup of coffee. It really lets me add variety to my coffee with out all the added calories. Great product! Great for around the holidays! This is by far better than the the big name coffee company's pumpkin spice. Plus its zero calorie and people that visit love the taste and always request it when they come over. A great buy! I just love the pumpkin pie sugar free syrup. I use it in the smoothie I make called pumpkin pie latte. That's made with café latte protein and the pumpkin syrup and since the syrup is sugar free it adds no extra calories or sugar! This coffee flavoring is great for the fall and people watching their sugar intakes. The residents love this product and the taste is actually great! Good alternative to sugar!